First Blu-ray/ DVD Disk | Its Madh !!! 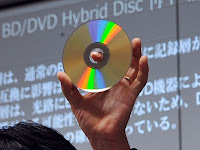 First Blu-ray Disc / DVD hybrid announced in Japan yesterday. This Hybrid Blu-ray/DVD disc is a combination of single layer Blue ray and normal DVD . It uses semi-reflective film between the blue ray and the DVD. It is compatible with the current DVD and the Blue ray players.